Most English speaking people call the French national holiday of 14 July ‘Bastille Day’ – supposedly after the storming of the Bastille in 1789. For the French, however, the national holiday is known as the Fête nationale. July 14 commemorates the Fête de la Fédération of 14 July 1790 – which was then a celebration of the end of a year of political turmoil that followed the storming of the Bastille. Today the focal point of this anniversary is a military parade along the Champs-Élysées, the oldest and largest regular military parade in Europe. But what of the Bastille today? The Bastille Saint-Antoine was originally built to protect the eastern approach to Paris from the English at the time of the Hundred Years War. Construction of the eight towered fortress began in 1357, but already by 1417 it had been declared a state prison. Louis XIV somewhat frivolously had upper class members of French society who angered or opposed him imprisoned in the Bastille. Not surprisingly then, the prison became a symbol of the excesses of the French monarchy. And for this reason it was a flashpoint for the French Revolution. Once it was captured, the building and its contents were touted around the streets of Paris as evidence of the machinery of torture, and used to justify the revolution and the overthrowing of the monarchy. The destruction of the Bastille, July 1789. Anon. The Colonne de Juillet in the Place de la Bastille. 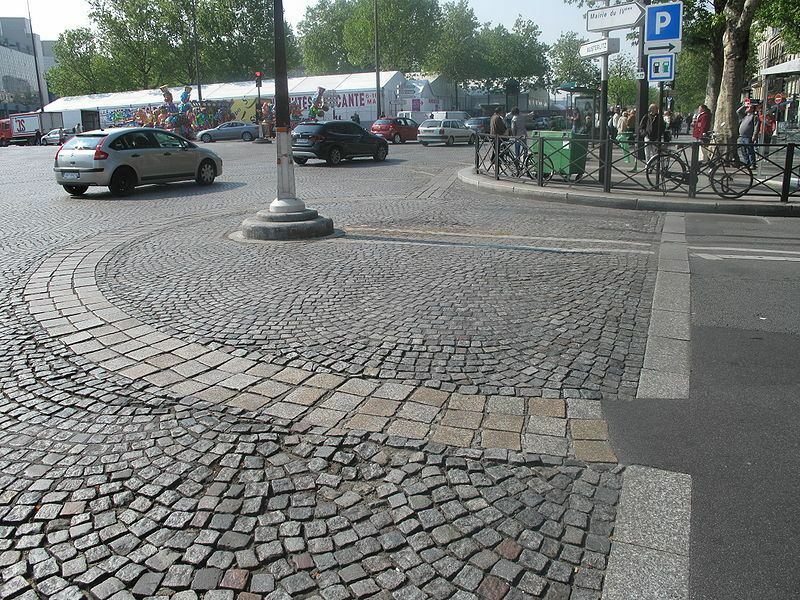 The Bastille once stood on what is now the Place de la Bastille. Pride of place in the centre of the square is the Colonne de Juillet (July Column), marking another, more recent revolution. 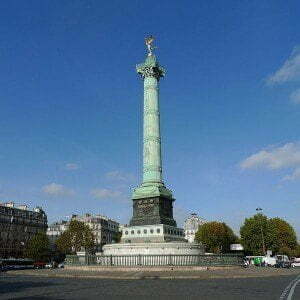 Although a column was planned to be erected in the square to commemorate the storming of the Bastille, for various reasons this never happened. Instead, a column commemorating the July Revolution of 1830 was was erected by King Louis-Philippe and inaugurated in 1840. The July Revolution, also known as the Trois Glorieuses — the “three glorious” days of 27–29 July 1830, marked the shift from one constitutional monarchy to another. It was then that King Charles X was overthrown for his cousin King Louis-Philippe, who only lasted 18 years before he too was deposed. Consequently because of its history, Place de la Bastille has been associated with revolution and dissent ever since the events of July 1789. Still today political protests and marches make a strong symbolic point by starting out here. 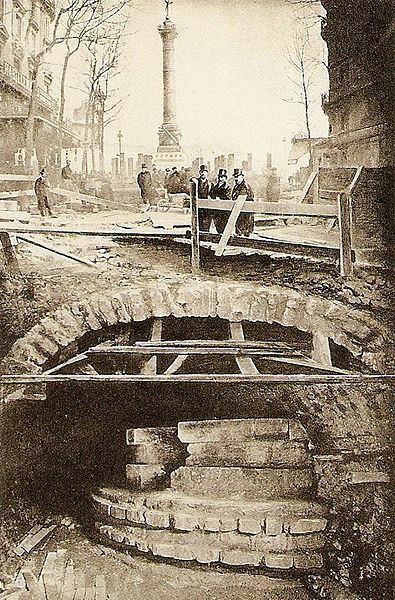 Excavation of the Liberté Tower foundations in 1899, with the July Column in the background. In the days and weeks following 14 July the revolutionaries were undecided about what to do with the Bastille. Opinions varied, some wanted the fortress destroyed, others wanted to occupy it as a fort, while others wanted to preserve it as a reminder of the revolution. By November most of the Bastille had been destroyed. 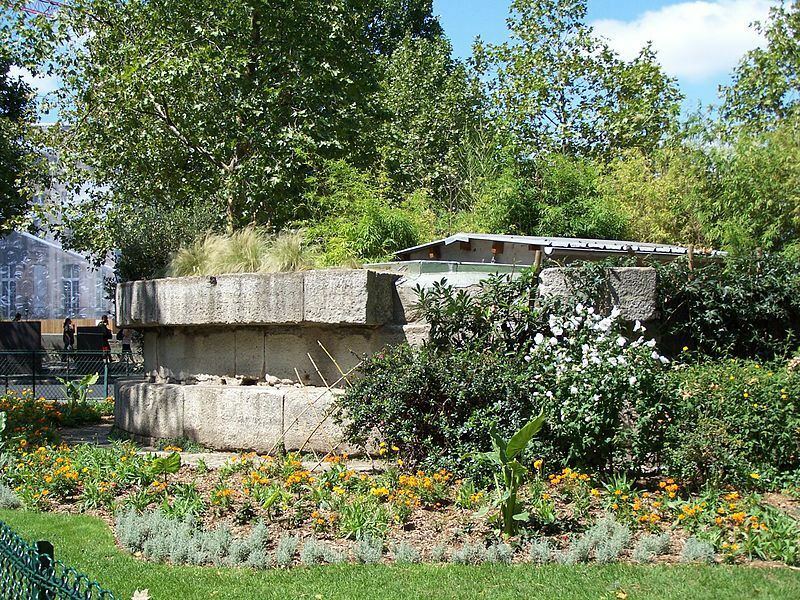 For die-hard fans of French or Parisian history, there are still some remains of the Bastille visible. et transportés sur cet emplacement. 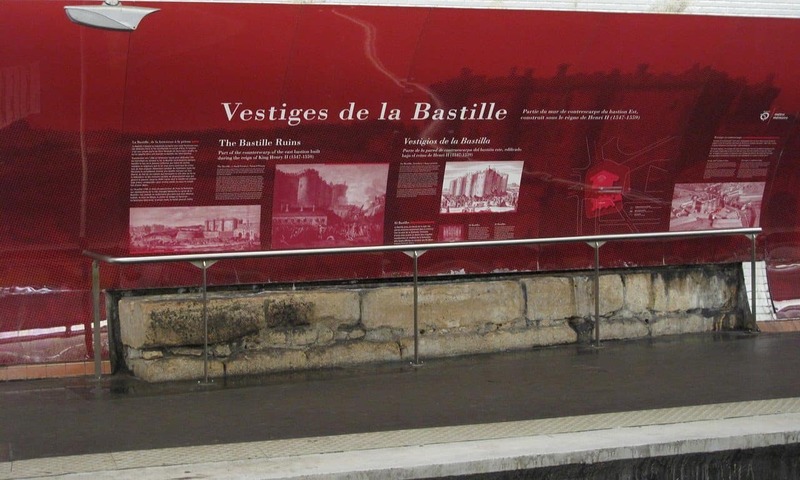 On the platform for the Number Five line within the Bastille Métro station is a small section of Bastille walling. An information panel (in French and English has been placed above these remains). Other in situ remains of the Medieval fortress can be seen along the side of the Bassin de l’Arsenal; named after a 16th century arsenal that was located here. Following the destruction of the Bastille, the bassin was excavated out of the remains of the canal that supplied the Bastille’s moat with water. During the 19th century this was a commercial dock serving the surrounding commercial interests, today the docks are ironically a pleasure boat marina. Stones from the Bastille are also said to have been used in the construction of the Pont de la Concorde. Outline of the fortress traced in cobblestones. 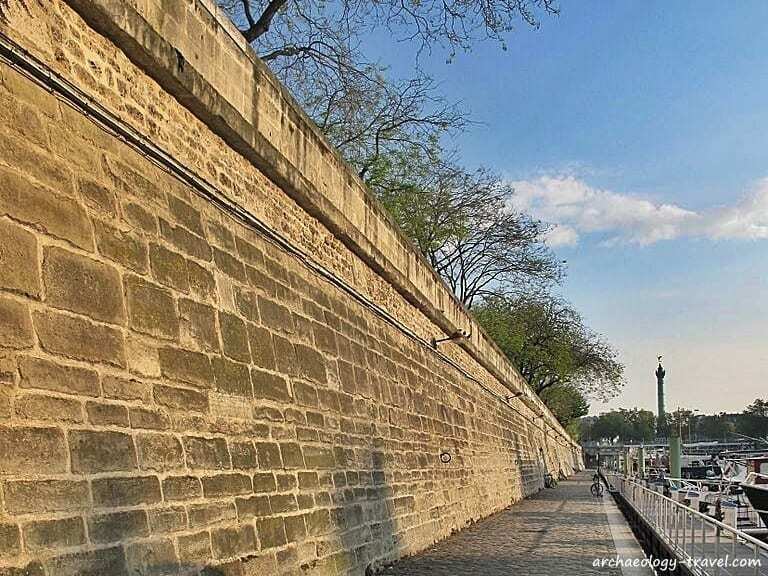 Original Bastille walls lines the Bassin de l’Arsenal. The Place de la Bastille is at the intersection of three of Paris’s arrondissements, namely the 4th, 11th and 12th. The locations of the various remains of the Bastille mentioned above are marked on the map below. Admittedly, the remains of the Bastille prison are probably not going to feature that highly on anyone’s list of must see historical sites in Paris. As meagre as they are, however, they are there for anyone wanting to visit the site of the Parisian uprising of 14 July 1789. For anyone interested in the history of Paris, the Carnavalet Museum, which is not that far from Place de la Bastille, is a must. Paris Pass or Paris Museum Pass: which one to buy? Disclaimer: Archaeology Travel receives a small commission if you purchase any ticket or activity you purchase through Get Your Guide. This does not mean you pay extra, the commission is taken out of the advertised fee, which is often the best price available.